One of our most praised off-road adventure by motorbikes in Tibet will be recorded as a journey of treasured experience and memories. We will bring you to Lhasa, the capital city of Tibet by overland then return back the same route via the highest Himalayas in the World, the Mt. Everest base camp. As you are at the elevation of 3000 meters or above in one day, rest is the must necessary part of the tour for acclimatization. Hence we will be spending this day in Nyalam. Morning:after breakfast we will start easy ride up, there is the main checkpost to enter further up at Nyalam. We will be visiting Milarepa's cave enroute. One can ride to Lhatze (300 km) this day but we are treating this trip as a pleasant journey, spending the night in Tingri makes you more comfortable having the great views of the Himalayas in the South including Mt. Everest. Overnight at a guest house. The riding is pleasant, you will be passing a 5220 meters pass called "Gyatso La" today and continueing riding down to the fertile valley of Lhatze for tonight stay at a local guest house. A typical day riding between the villages to Xigaze or Shigatse, the second largest city of Tibet. The ride today is across Yulung La (4950 metres), over fairly unpaved roads in the plateau area. After reaching Shigatse, we will transfer you in a better hotel and relax. If interested, you can visit the "Tashilhumpo Monastery", a vast monastery with its own streets, housing sectors, plazas, back alleys and complex of temples and halls. Your drive on to Gyantse takes us through intensely agricultural, cultivated areas. Much of the gravel road is lined with poplar trees, which are a distinctly Tibetan feature. The drive on this day is just 90 km but, if interested, you can drive to the small, picturesque village of Kardoi from Gyantse (120 km round trip). This excursion will also take you to an old castle, Kumbum and Palcho Chode monastery. The hotel in Gyantse has good facilities, like the one in Shigatse. You will drive mostly on a paved road, though there is an off-road route from Gyantse to the turquoise Lake "Yamdrok Tso". 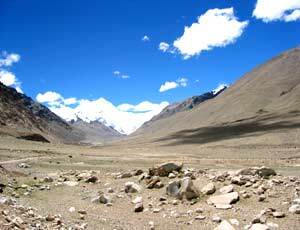 You will be crossing the high pass of "Karo La" at 5050m then continue your drive to Lhasa. On arriving you may feel as though we have left Tibet and entered China, for the Chinese influence - signs, people on the street, development - is ever more pervasive. And upon reaching Lhasa itself, you will see the suffocation of the old Tibet by the new layers of Chinese infrastructure, covering nearly 100% of the city. Lhasa is a sprawling, modern Chinese city with polluted air and horn-honking traffic congestion but we will stay there for two full days to acclimatise and take in the awe-inspiring Potala and other parts of thisr World heritage site Elevation - 3650 metres. Riding around Lhasa visiting the various interesting sites (Potala Palace, Sera monastery, Drepung Monastery, Norbulingka palace etc). Your riding today will be on paved road. After having breakfast we'll follow the riverbed of the Kyi Chu River, this is the same way back until road adjacent to a bridge at the Brahmaputra valley. 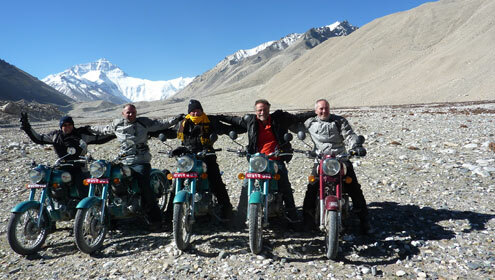 Then we take the straight highway riding on the riverbed of the "Yarlung Tsangpo" to Shigatse, stay at the hotel. After a good breakfast, we start riding from Shigatse to Lhatse then ascent to the Gyatso La-5220m, finally descend into Xegar and stay in a Everest View hotel (luxurious accommodation after Shigatse). Today you will find much excitement. Here starts the taste of the "Top of the World"; the remoteness shows the real beauty of the area that makes you pride of your awaiting since long time. Riding through the remoteness you will be ascending to the Rongbuk.Excursion to Everest base camp- 5200m and back to Rongbuk and overnight stay at Rongbuk Guest house. We definitely would double the spirit after visiting the base camp of "Top of the World" and be ready for another long ride to Nyalam following the Northwest direction ascending via Lablung La (5120 meters) and Thong La pass. Here, we would see the northern front of the great Himalayan range. A wall of spectacular snow clad giants on the Nepal side of the border. Stay at a guest house in Nyalam. Start 35 Kilometers down hill from Nyalam to Zanghmu, the altitude dramatically decreases by 1300 meters in approximately 1.5 hour. Since Zhangmu is the exit point, we will follow the custom clearance, immigration & check post clearance both in Tibet and Nepal border. Continue drive to Kathmandu by private vehicle arranged by our company, transfer to the hotel. 5. Costs associated with cancellations, delays & porters due to roadwork. In such a situation the use of porters will cost approx $20-30/person. - Itinerary is subject to change depending on conditions and logistics.